Aluminum Attraction | Weldtech Training Inc.
From its strength and versatility to its corrosion resistance, aluminum offers benefits that make it an appealing material for a variety of industries. The material however, is not without its challenges when it comes to welding. Because of its low melting temperature and high thermal conductivity, extra care must be taken to prevent burn through on thinner material and to ensure adequate fusion or penetration on thicker material. Using the appropriate equipment- machines that offer pulsed MIG capabilities or TIG capabilities is important. So too is selecting the right filler metal and understanding the weld characteristics each type provides. There are many aluminum filler metals available in the marketplace, including those for applications found in aerospace or architectural structures, to filler metals for heat exchangers, trailer fabrication and more. The filler metals range from pure aluminum to varieties with added copper, silicon or magnesium. Among the variety of aluminum filler metals, 4043 and 5356 alloys are the most common and the least expensive. 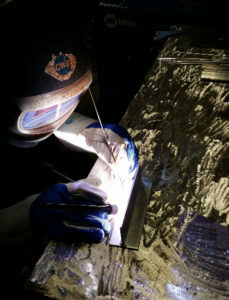 Together, those filler metals are used for welding about 80 per cent of the time and are available in wires for MIG welding or cut-lengths (often called filler rods or straight lengths) for TIG welding. Knowing how to choose between the two alloys, as well as the characteristics each provide is important to producing good weld quality. A spool gun or push-pull gun for the MIG welding process. These guns provide consistent feeding of the aluminum filler metals, minimize wire feeding issues and allow for welding further distances from the wire feeder (often as far as 30 feet away). These drive rolls prevent the wire from being pinched or compressed, and help ensure proper wire feeding. Nylon inlet guides and liners. Unlike metal components, nylon components won’t “shave” the wire as it feeds through from the wire feeder to the contact tip, lessening the opportunity for build-up of debris inside the liner. Contact tips for aluminum wire. Consumables for aluminum wires typically have a “A” (for aluminum) stamped on them and are sized accordingly for these type of wires. For example, 4043 and 5356 wires are available in 0.047 inch (3/64 inch) diameters (as opposed to the standard 0.045-inch diameter of steel wires), so the corresponding bore on the contact tip for these wires is slightly oversized, allowing for smooth wire feeding and good arc stability.